• One of the main goals for the 2018-19 Portland Trail Blazers is to be more consistent from month to month. Over the past five seasons, they have either gotten off to poor starts, only to make a run late in the season, or fast starts followed by trailing off as the season wears on. While Portland has still managed to make the playoffs in the last five seasons despite those considerable peaks and valleys, it’s a trend that they’d like to end this year. But after vowing to get the 2017-18 season off to a fast start, a goal they failed to achieve, even the players seem to be taking a wait-and-see approach this time around. By some estimates, the Trail Blazers have the NBA’s most difficult schedule to start the season, which makes getting off to a good start as challenging as it is important to their goal of returning to the postseason for the sixth-straight year. And considering all but a few of the 15 teams in the West have a legitimate shot of making the postseason, getting off clean out of the gate and then sustaining it throughout the season feels like a necessity. • Last season, some speculated that Trail Blazers center Jusuf Nurkić might add the three-point shot to his offensive repertoire. And when Nurkić could be seen regularly at practices and prior to games taking and making three-pointers at a better than average clip, that prediction seemed feasible, if not entirely likely. But while the 7-0 center attempted more three-pointers during the 2017-18 season than he had in his first three seasons in the NBA combined, he still took just seven triples over the course of 79 games. What’s more, he missed all seven of those attempts and is 0-for-13 from three in his career. However, there are early signs that the 2018-19 season just might be the year that Nurkić joins the ever-growing ranks of three-point shooting centers. He took multiple three-point attempts while playing with the Bosnia and Herzegovina national team prior to the start of training camp and he put up two three-pointers, making one, in Portland’s 122-104 loss to the Toronto Raptors in their first preseason game of 2018. Add in that Trail Blazers head coach Terry Stotts has made shooting more threes a goal for the team this season, and the stage is set for the “Bosnian Beast” to once again to take more threes this season than he has throughout the totality of his four-year NBA career thus far. • Near the end of the 2017-18 season, Trail Blazers forward Maurice Harkless underwent arthroscopy to remove a loose body from his left knee. 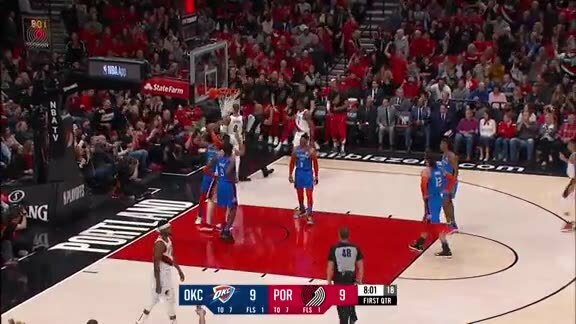 The injury and subsequent surgery forced Harkless, who was integral to Portland's late-season playoff push, to miss the last nine games of the regular season and the first game of the playoffs. While he would return for Games 2 and 3 of Portland's first-round playoff series versus the Pelicans, he sat out the deciding Game 4, which might have been due to linger pain or the simple fact that no team has ever come back from a 3-0 deficit to win a playoff series. Harkless has been on light duty ever since and is not yet clear to fully participate in practice going into the second week of training camp. But it sounds as though Harkless's time relegated to non-contact drills might be coming to a close. He went through a light workout prior to Portland's preseason game versus the Raptors on Saturday -- he noted in the locker room prior to the game that he felt as though he could play -- and said after the Wells Fargo Fan Fest Sunday night that his hope is to return to full action in time to play in at least one preseason game, if not a couple. "I’m in a pretty good spot," said Harkless, who is expected to start at small forward for the Trail Blazers this season. "Not sure what game I’ll try to get out there but I definitely want to get out there for a couple games. We’re working toward that every day, just trying to add more load every day and continue to build."